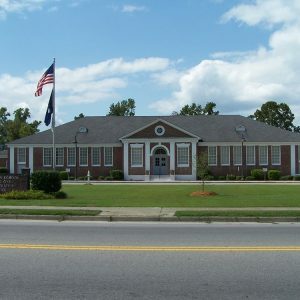 Built in 1936 for white students, Summerton High School is significant for its close association with the U.S. Supreme Court decision that struck down segregation in public education. In 1947 Levi Pearson, a black landowner, petitioned the local school board to provide school bus transportation for his children, detailing the glaring differences in expenditures, buildings, and services available for white and black students. That petition led to a series of court cases that eventually resulted in the Brown v. Board decision in 1954. Of the five schools mentioned in Pearson’s petition, Summerton High School is the only one still standing. It now houses the administrative offices for Clarendon District One schools.